Filename extensions are important pieces of information that Windows uses to determine what a file contains. Change it, and you could lose access. Recently, been having a problem when I try to rename a picture or an icon, the following message appears: "If you change a file name extension, the file may become unusable". I have lost pictures when I went ahead and ignored the message. Why am I suddenly having this problem? I don't know why you're suddenly having the problem, but I do know what the problem is. You actually haven't lost your pictures - you've just removed the information that tells Windows what to do with them. basename is the base name of the file . This is probably what you think of as "the name", in that it's the part you choose to name or describe the file. .ext is the extension. This is the part that tells Windows what kind of file it is. "I'm going to assume you're renaming your file using Windows Explorer, since that's where it's very easy to run into the problem you're seeing." The "filename" typically refers to the base name plus extension or basename.ext. I'm going to assume you're renaming your file using Windows Explorer, since that's where it's very easy to run into the problem you're seeing. 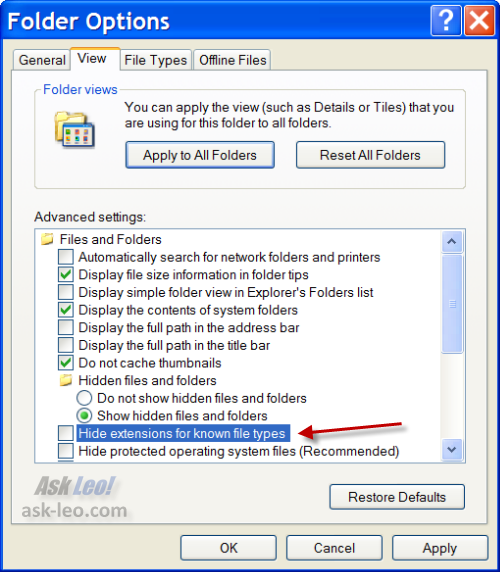 Even though almost all files have the extensions, Windows Explorer does not display them by default. This is a huge mistake in my opinion, but it is what it is. This is Windows Explorer in Thumbnail view on a folder of some pictures I have. Note how the filenames don't show any extensions. As you can see, each filename's extension is now visible: these are ".JPG" and ".NEF" files. Regardless of the path that you took to rename your file, that's the problem - the filename's extension is missing or incorrect. Simply by including the ".jpg" when I renamed the file, Windows understanding of what that file is has been preserved. I strongly recommend not hiding extensions in Windows Explorer, as demonstrated above. Hiding extensions can actually allow malware to trick you into thinking they're something that they're not. 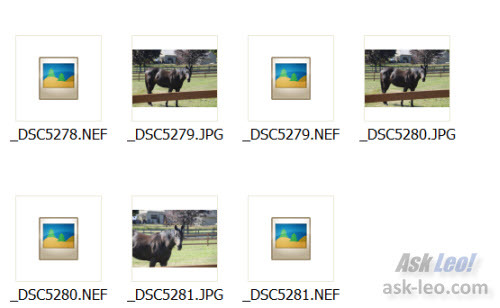 For example, with extensions hidden "horse.jpg.exe" would display as "horse.jpg". You might think it's a picture, but it's not - double clicking on it could launch a dangerous piece of malware. In that same vein, be careful to know what it is your acting on - it's not that uncommon to see pictures named "horse.jpg.jpg" because people didn't realize extensions were hidden. It's typically benign, but it can be confusing. Again, not hiding extensions solves this problem. You'll note that ".JPG" and ".jpg" were treated the same way. In general extensions are case insensitive - .jpg is the same as .JPG - in Windows (though they are typically case sensitive - .jpg is not the same as .JPG - when uploaded to web sites). Best to pick one approach and stick with it. You cannot change a file's type simply by renaming it. For example, you can not change a jpg file to a png file just by changing the extension to ".png". It may be called a ".png", but it's still a jpeg file on the inside. How do I know which program is used to open a particular type of file? It's not always obvious what program should be used to open certain types of files. There are clues if you know where to look and what to look for. The idea is obviously to make file management idiot-proof, but it really makes a lot of sense to learn how to recognise and use file extensions. I automatically unhide them on Windows installations. Vista took a step in the right direction by only highlighting the actual file name when renaming. I found this article to be very informative . It has given me very good information.I had no idea how to make the changes you have just shown. I have file extensions showing, as it may show up a rogue .exe masquerading as something else. I use this site when I run across an extension that I don't know which program it belongs to. It also helps when checking the default file associations, especially after a new piece of software starts changing those associations. There are other sites out there that do the same thing, but this one suits me the best. Finally you have solved my identical problem which I have been having with file name changing and receiving the same dialog box. Thanks ever so much. For this and the related 3 articles I will buy you a coffee. The articles solve many problems I have had over time and still get once in a while. Thanks for that info... I learned something today! Now why those little pesky things pops up makes sense! I had no idea how to fix it. Would this be a backdoor way to make a file inaccessible to someone else? Say I have a journal I keep in Word but don't want anyone else to read it. Can I simply to to Explorer after saving it, take off the .doc extension, then, when I want to open it, go to Explorer, edit the filename to add the .doc? Would this hurt the file any after doing it several times? It won't hurt the file, but it could be discovered if someone went looking. "Security by Obscurity" is rarely a truly secure approach. If it's important, encrypt it. @Alexis Corelis -- For a personal journal? ...Maybe -- and that's assuming whoever wanted to read it had to find it first and was not particularly computer-savvy. But for anything even slightly more important than that, changing the file extension is more likely to be completely ineffective. Even on Windows, it's trivial to detect the type of most commonly-encountered files even if the extension part of their filename is missing or corrupted: all one has to do is open the file and try to recognize what's in it -- in many cases, this is as simple as reading the first couple of characters. For instance, an .exe file (or a .dll, for that matter) can be recognized from its first two characters: "MZ". A .zip file will start with "PK". Linux ELF binaries all start with the characters "ELF". All of these are part of the standard that defines how these files are created and used, which means there are very well-known signs to watch for when trying to find out what type a file is. The main reason against detecting a file type this way (and thus making the extension irrelevant as a way of actually determining a file type) is that opening, say, 1,000 files in the same directory in order to read the first few characters in them is a slow process. Nonetheless, I'm vaguely certain Linuxes (and probably Mac OS X) have been doing it for a while now. On my Xubuntu, I can rename "my-pic.png" to "hahaha" and it still gets properly detected as a PNG image and opens correctly if I double-click it. Note that this is something I can do without any work on my behalf at all -- it's part of the OS itself. And I'm certain the same capability could be built into Windows, at some potential (small) cost in speed. To summarize: an extension is just part of a file name, which is why it's not likely to be particularly trusted as anything but a first guess at what might be inside. As such, renaming a file to hide its extension does not make it any more secure than moving it into the recycle bin and moving it back out when you want to work on it. If you have any type of data you truly consider sensitive, use some kind of encryption to hide it behind a password or passphrase only you know. Leo has been recommending TrueCrypt for a good long while, and with good reason. @R: You could also try http://dotwhat.net/ which is pretty useful, thanks for the tip though. All I can say is "Thank You" Leo! This fixed my problem and so simple if its wrote out:-) for me. You are now on my FAVs. I really did appreciate the simplicity of it more then anything. O yeah and it fixed the problem. Thank you so much Leo. This problem has bothered me for forever and I had almost run out of patience. Your explanation not only only told me how to fix it, but it also told me why this was happening which is so important to me. Thank you again for your easy to read easy to understand explanation! Renaming files-Why cant i rename a file those with " ? ' and some files with little squares "-as part of the name of the file-i get a message which say " you cannot rename this file ........ use ms dos ..... ?Wat does it mean ???? Some characters such as ?,* or / are not allowed in filenames because they are reserved for system use. ? and *, for example, are used in wild card searches and are disallowed as characters in a file. / is used as a directory separator.